Being Frugal and Making It Work: Starbucks: Buy One Latte, Get One Free on Valentine's Day‏! Starbucks: Buy One Latte, Get One Free on Valentine's Day‏! 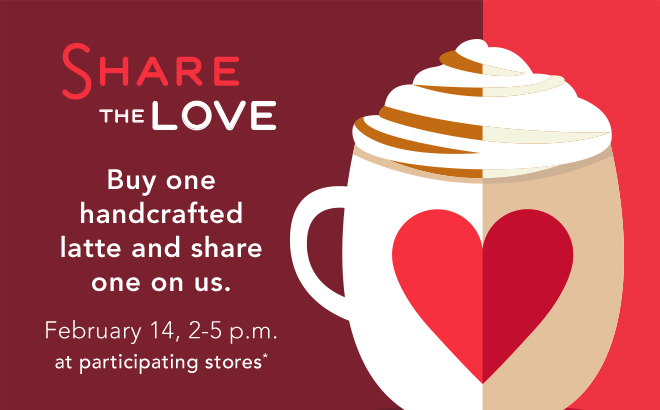 Make Valentine's Day just a little bit sweeter, and share a free Starbucks latte with someone special! From 2 - 5pm on Valentine's Day, buy one latte and get another one absolutely FREE. *Offer good between 2-5 p.m. on 2/14/14. Purchase any handcrafted espresso or tea latte and get one of equal or lesser value. Offer good only at participating Starbucks® stores in the U.S. Cannot be combined with other offers or discounts! What is your favorite Starbucks coffee? Looks like I missed out! I seriously wish I would have seen this sooner. Love Starbucks! I wanted to treat my daughter to this because she works in a grocery store that has a Starbucks, but she beat me to it and bought one for herself and gave her free one to a co-worker! I sure hope they do this again this Valentine's Day! What a treat. February #LoveMe Challenge: Day 28! February #LoveMe Challenge: Day 27! February #LoveMe Challenge: Day 26! February #LoveMe Challenge: Day 25! February #LoveMe Challenge: Day 24! February #LoveMe Challenge: Day 23! February #LoveMe Challenge: Day 22! February #LoveMe Challenge: Day 21! February #LoveMe Challenge: Day 20! February #LoveMe Challenge: Day 19! February #LoveMe Challenge: Day 18! February #LoveMe Challenge: Day 17! February #LoveMe Challenge: Day 16! Build-A-Bear Workshop - Review & Giveaway! February #LoveMe Challenge: Day 15! February #LoveMe Challenge: Day 14! February #LoveMe Challenge: Day 13! February #LoveMe Challenge: Day 12! February #LoveMe Challenge: Day 11! February #LoveMe Challenge: Day 10! February #LoveMe Challenge: Day 9! February #LoveMe Challenge: Day 8! February #LoveMe Challenge: Day 7! February #LoveMe Challenge: Day 6! February #LoveMe Challenge: Day 5! February #LoveMe Challenge: Day 4! February #LoveMe Challenge: Day 3! February #LoveMe Challenge: Day 2! February #LoveMe Challenge: Learn to Love YOU!